You don’t need expensive software to write, design, and create PDFs for self-published, print-on-demand books. 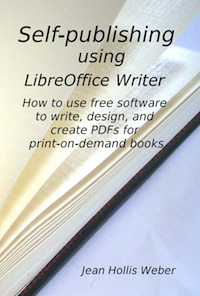 LibreOffice Writer is free, easy to use, and has powerful page layout features suitable for producing books such as novels and short story or poetry collections. This book explains how to write, edit, and design a book; lay out the pages using styles and templates; build a table of contents and index; include pictures, graphics, and special effects; and create a PDF for submission to POD services. Printed copies are available from Lulu.com for US$15.37. Pay at Lulu.com. Download PDF here. Cost is US$5.00, on the honor system. Please pay using the button below (Paypal or credit card). This book has no DRM; you may copy it onto as many of your devices as you wish. If you buy a printed copy, you are welcome to a free copy of the PDF.